Spring days are ahead and with them come St. Patrick’s Day and Easter. I am starting to see a lot of green linked up. 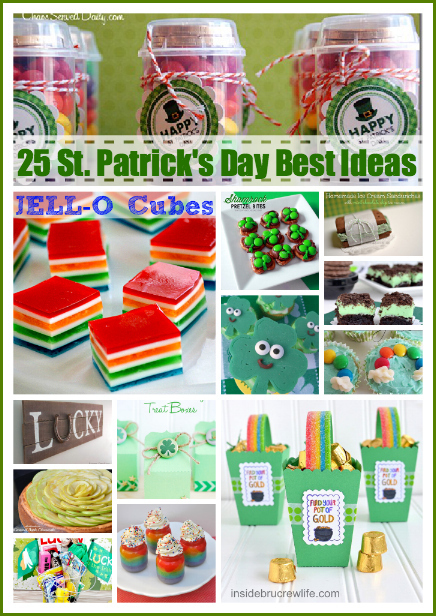 I am featuring today 25 St. Patrick’s Day Crafts, recipes, and lucky ideas from the party. 1. 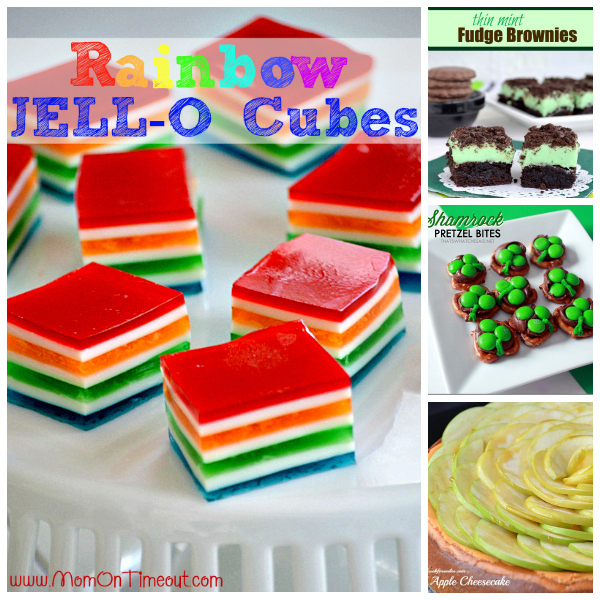 Rainbow Jell-O Cubes by Mom on timeout. 2. Thin Mint Fudge Brownies at Inside BruCrew Life. 3. Shamrock Pretzel Bites at That’s what Che said. 4. Caramel Apple Cheesecake at Will cook for smiles. 5. 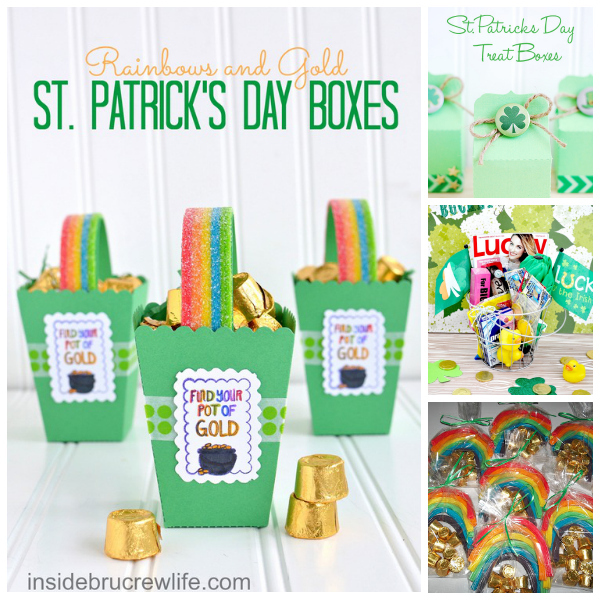 St. Patrick’s Day Boxes at Inside BruCrew Life. 6. 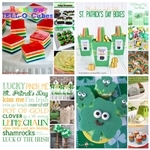 St. Patrick’s Day treat boxes by A pumpkin and a princess. 7. Bucket of Luck at Maybe I Will. 9. 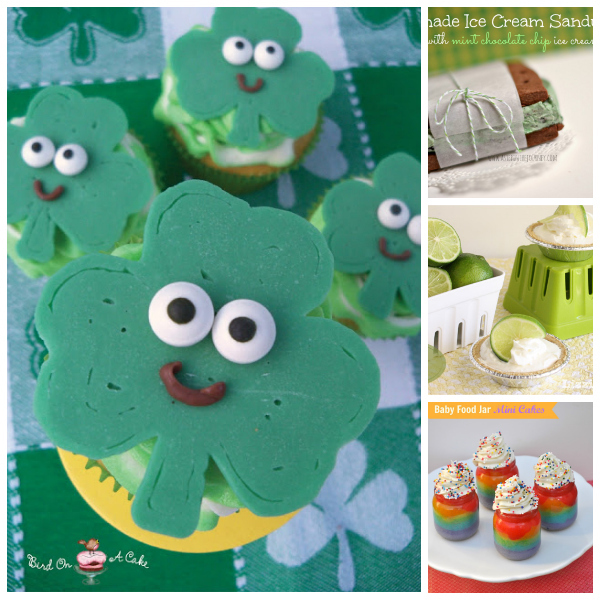 St. Patrick’s Day Shamrock Cupcakes Toppers at Bird on a cake. 10. Homemade Ice Cream Sandwiches by A step in the journey. 12. Key Lime Pie at Lizzie Jane Baby. 14. Lucky St. Patricks Day sign at Fynes Design. 15. St. Patrick’s Day Cupcakes at A typical English home. 17. St. patrick’s Day Kissing Balls at How to nest for less. 18. No sew St. Patricks’s day Banner at The Benson Street. 19. Thin Mints Shake by Your homebased mom. 20. 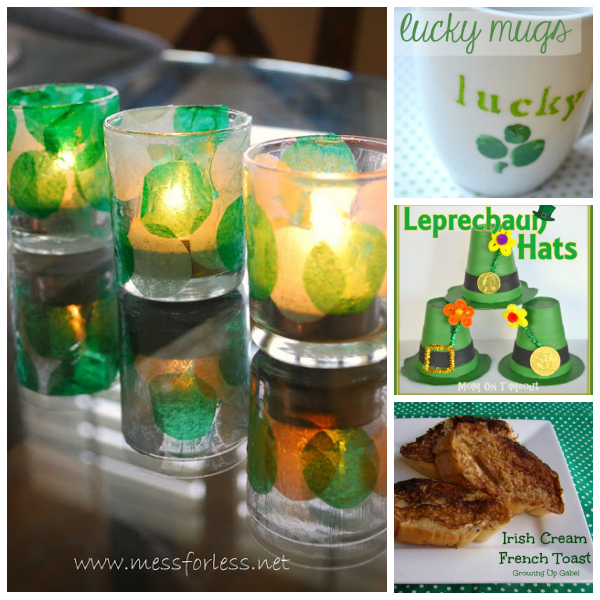 St. Patrick’s Day printable at How to nest for less. 21. St. Patrick’s Day Votive at Mess for less. 22. 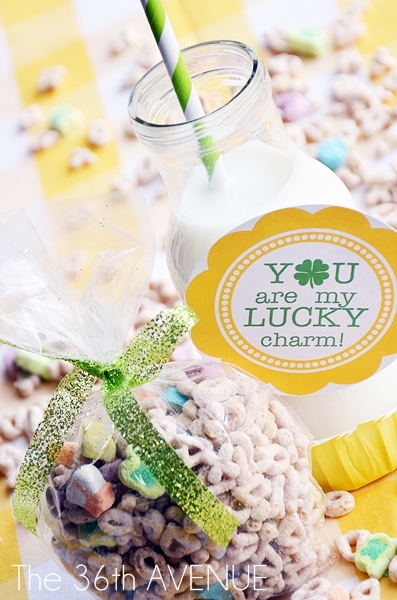 Lucky Mugs by Lemon Tree Dwelling. 23. Leprechaun hats by Mom on Timeout. 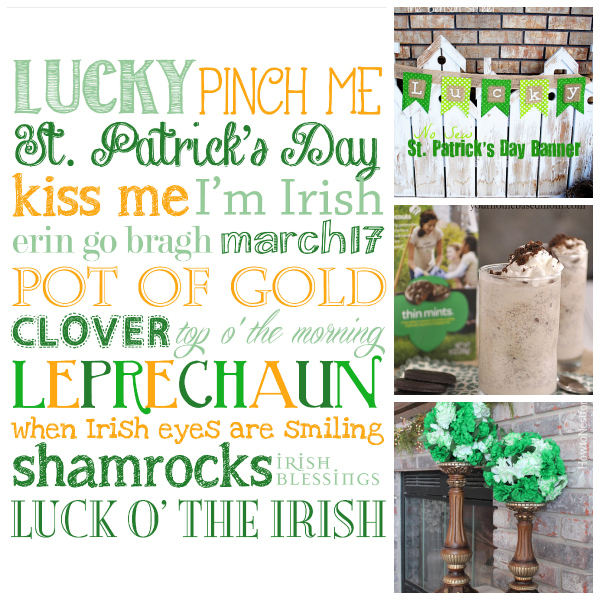 Before you go also check out our St. Patrick’s Day Breakfast and free printable. 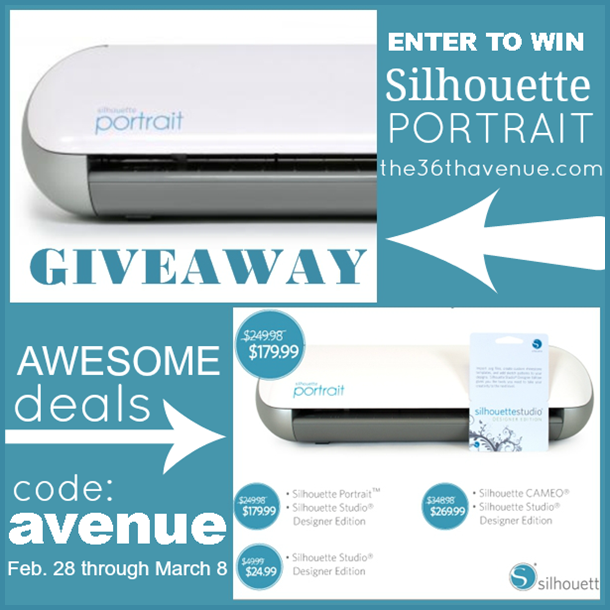 And don’t miss this week’s Silhouette Giveaway and amazing deals! 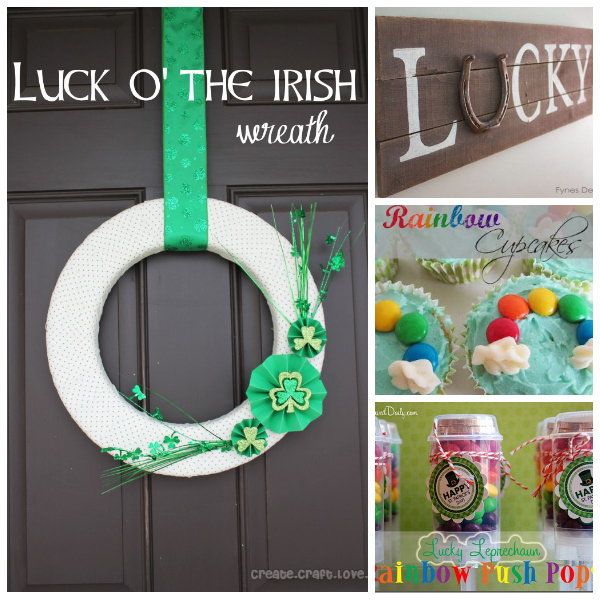 Don’t you think all of these St. Patrick’s Day Ideas are adorable? And some of them are even delicious… lucky us! thanks for featuring my Shamrock Pretzel Bites sweet friend! Will I see you at SNAP this year??? Desiree! I am soo thankful you featured my no sew Lucky Banner! I appreciate it. Lots of fun cute ideas! Thanks for all the inspiration!